“Rising Tide Leaves Workers Behind” cartoon, St. Louis Post-Dispatch, September 5, 2006. (R.J. Matson). Qualifies as fair use due to lower resolution and relevance to topic. It’s been a week and a half since my last post, mostly because I’ve been busy with other projects. Kind of like the American aristocracy, as they continue to distract us plebes with controversies over “religious freedom” laws and undisclosed emails while continuing to hoard trillions in wealth. Not that these controversies are just abstract distractions, but they follow a pattern of division, deception, and misdirection. Our nation’s elite impose their views of the country and the world in such a way as the truth itself becomes a lie. Apparently for them, the First Amendment to the US Constitution’s a lie, since this first of these Bill of Rights guarantees “Congress shall make no law respecting an establishment of religion, or prohibiting the free exercise thereof.” This Establishment Clause has NEVER been absolute, especially in cases in which religious practice violates or interferes with others’ civil and constitutional rights. 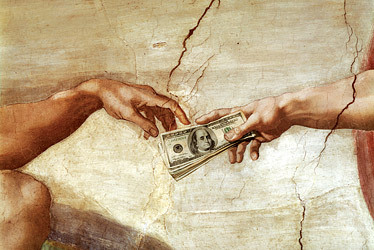 Michelangelo’s The Creation of Adam via Sistine Chapel ceiling paintings (1508-1512), with America’s Prosperity Gospel stuck in between, September, 2009. (http://www.thegospelcoalition.org/). But for the purposes of my post today, this truth-as-lie isn’t the biggest one the American plutocracy has pulled on us in the past forty years. Not even close. You see, the biggest lie they’ve sold us as truth is the idea that the US has been going through bust and boom cycles as normal for any wealthy capitalist democracy since the 1970s. That with every recession, or period of inflation, or deflation, or job stagnation, or changes in the economy, that a period of unbridled growth and social mobility has followed, keeping the American middle class the richest of the middle classes on Earth, indeed, in the history of the world! Let’s start with the reality that median income has declined enough to show evidence of a shrinking American middle class. This decline isn’t a recent phenomenon. Since the end of World War II, there have been two lengthy patterns. One is a pattern of great economic growth, coinciding with America’s dominance of the global economy between 1945 and 1973. This growth of median income by a factor of six (from $2,379 in 1945 to $12,050 in 1973) was a reflection of the US economy’s glory years. The other is the current pattern of a slow, sometimes meandering but steady decline of economic dominance. All during a period of greater competition from Europe and Asia, job outsourcing, and a reduced industrial base, the last the heart of America’s economic growth before 1973. Sources: US Census Bureau, Current Population Reports, P60-002, P60-043, P60-097 , P60-146, P60-188, P60-226, P60-245, Consumer Income (now Income, Poverty and Health Insurance Coverage): 1948, 1964, 1975, 1985, 1995, 2004, 2013. (http://www2.census.gov/prod2/popscan/ and http://www.census.gov/prod/). Calculations based on CPI Inflation Calculator via the Bureau of Labor Statistics and DollarTimes.com, using 2013 as the most recent calendar year baseline (http://data.bls.gov/ and http://www.dollartimes.com/). Median income in 1973 was 20.1 percent higher ($65,000) than it is today ($52,000). In the intervening years, median income never grew enough to match or exceed the growth that occurred during the peak of the middle class’ development. Not in the years after the double-dip recession of the early 1980s. Not even after the Information Revolution under the business and credit-friendly Clinton years of the 1990s. The dot.com boom-turned-bust, April 2, 2015. (http://www.sf-info.org/). Keep in mind, too, that the 400 wealthiest households in the wealthiest nation of all time hold a net worth that exceeds the net worth of the bottom fifty percent of all US households. It’s simple math, really — 400 > ~100,000,000 households or roughly 155 million people with kids and other relatives. Or, $1.5 trillion for 400 > $1.4 trillion for 155,000,000. As sobering as this is, it’s not the whole story, not for those Americans working under the assumption that they are middle class. According to the Census’ latest report using the SPM (November 2013), 16 percent of Americans (49.7 million) live at or below the poverty threshold of $23,000 in income/resources per year, while another 31.2 percent (97.1 million) have at most $46,000 a year in income/resources, fitting the SPM definition of low-income. Another 107.6 million Americans have incomes/resources that are between two and four times the national poverty threshold (or between $46,000 and $92,000 in total resources per year), while the top 56.6 million of Americans (18.2 percent) have annual incomes/resources above $92,000. 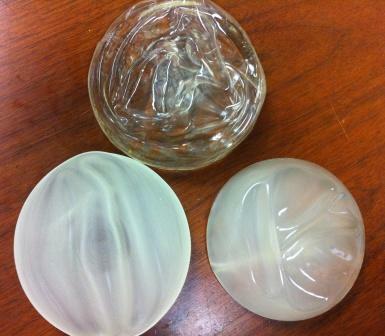 Large saline and silicone breast implants — could easily be, housing boom (1999-2008), dot.com boom (1994-2001), credit boom (1973-? ), April 2, 2015. (http://medcitynews.com). There are two really simple reasons why most Americans don’t see the plutocratic lie of “prosperity for everyone” despite all evidence of the truth. One is because they believe in that dangled carrot of somehow becoming rich, through hard work, prayer, giving out of need, or sheer luck, despite the debt it takes to remain even somewhat middle class. Two is because most believe they’re prospering whenever the Dow Jones’ Industrial Average breaks 10,000 or 15,000, or because the media faithfully reports monthly declines in unemployment, or because the average White family has a net worth that’s eight times that of Black and Latino families. And those beliefs are reinforced by the societal taboo of rarely, if ever, talking about our income, our net worth or lack thereof, by acting as if the poverty or prosperity conversation violates the US Constitution. Without this serious conversation, how can we really claim that any tide of economic prosperity has lifted any boats other than those of the yacht-owning set since 1973?